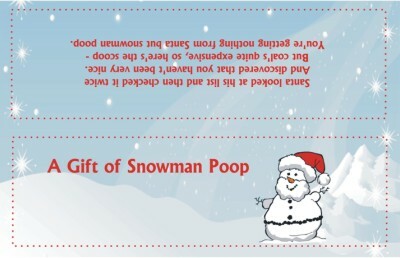 “Snowman poop” is a fun gag gift to make during the Christmas holidays. Kids love it, and so will your coworkers. And it’s easy to “make.” All you need is some marshmallows or little white mints, a plastic bag, and a silly poem. Put them all together and your marshmallows magically turn into snowman poop! The free printable snowman poop poem shown on this page can be downloaded, printed and cut out to form a fold-over bag topper. The .pdf file includes two bag topper designs on each page. Simply download the file, print it at home, cut out the two poems and then attach them to the marshmallows by folding the poem over the top of the bag. Then have fun spreading some Christmas cheer.